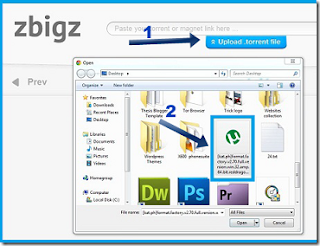 After sign up is finished go to your torrent search engine and search for the file which you want to download with idm. Then download your torrent from your desired torrent website. Now go again go to ZIBGZ.COM(click here) . Then click on the upload buttom and choose the torrent which you want to download. Then,click on button go. Next a window will pop up asking for free or premium download.now click on the free download. After choosing free your torrent will be downloaded by high speed servers and your file will be ready to download.